A luscious gluten free chocolate zucchini cake perfect for using up those extra garden zucchinis! 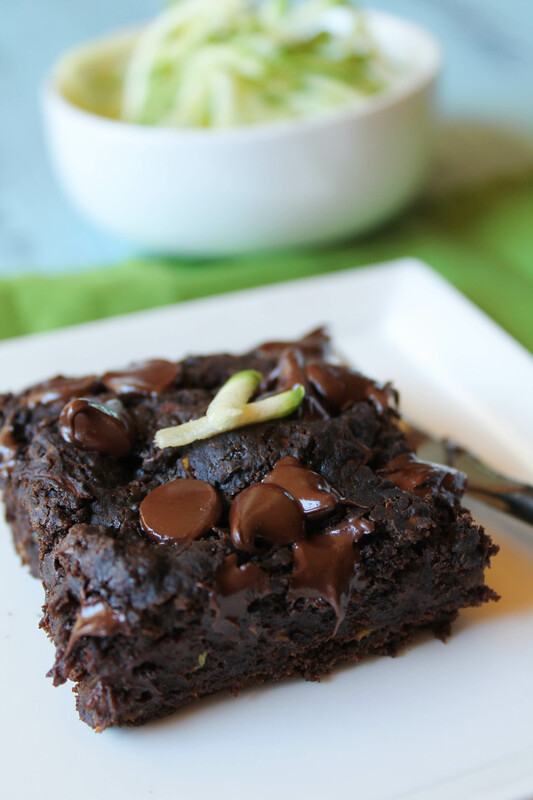 Totally dairy and egg free, this ultra moist cake is a wholesome treat to serve your family. I have more than my share of zucchinis right now. Being a savvy gardener, I only planted ONE plant, knowing how prolific a single plant can be. And I swear, I could time lapse the growth of one, they grow SO rapidly. One day you have normal 12″ or under zucchini, and two days later, you have Zukezilla…really! Some people don’t believe me, but it happens all the time! My Romenesco plant is very happy in it’s fertile, well mulched soil and is churning out 1-2 new zucchinis a day, so of course I have to use my imagination to put all this beautiful veg to use. I have made some delicious things, but of course, the time is not always ripe to whip out the camera and attempt to capture the scrumptious results for the purposes of my blog! 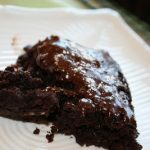 I have made some zucchini chips that were pretty amazing, and a zucchini casserole that made me swoon….and now this lusciously moist treat: chocolate zucchini cake. Here is one time I know, my middle child will have NO problem eating some veggies! Rich dark chocolatey taste with a moist crumb..got to love it! If you would like to make this easy to pack in a lunch box, I suggest instead of frosting, mix in a cup of chocolate chips…it will be cleaner AND easier! Update: we currently use this Paleo frosting for this cake, and many others! We just add some salt and vanilla extract for flavor balance. Lately, for ease, I puree all the wet ingredients in my Blentec blender, then add in the dry ingredients right on top! No visible vegetables for picky kids! 1/2 cup unsweetened cocoa powder sifted if lumpy! 2 cups shredded zucchini packed *Tip - if you have any veggie-phobes in your household, you could puree the zucchini in a food processor so it is not detectable. 2 cups powdered sugar I would try this with powdered palm sugar next time! Preheat oven to 350 degrees and grease a 9 x 13 pan. In a large bowl, mix together the oil, sugars, and vanilla. Add in the remaining ingredients minus zucchini. Stir vigorously to combine well: mixture will be dry and crumbly. Stir in the zucchini. The moisture from the zukes should bring the whole batter together like a typical brownie/cake batter on the thick side. Pour/coax into the prepared pan and bake for about 25 minutes until a knife inserted in center comes out clean. I had to bake mine a little extra, the moisture content of your zucchinis will drive this. Let cool for about 10 minutes and then invert on a cooling rack. At this point you can make the frosting for the cake. In a microwave safe bowl or over a double boiler, melt the butter/margarine. Remove and mix in the cocoa powder, then the powdered sugar, milk and vanilla. Honestly how good does this look!!! Yummy! Made on a whim due to chocolate craving last night… subbed DATE SUGAR for the palm and added 1tbsp honey to sweeten a bit, topped with honey/coconut oil/cacao ganache and pecans. So good. When I make again I will decrease the baking soda by 1/2 tsp because I could taste it. But really yummy treat, great texture! Glad you liked it Lindsay! Oat flour is not gluten free due to processing. Substitute sorghum flour. Thanks Sandy…I forgot to specify gluten free oat flour. We actually can’t do oat flour anymore either, so I usually use a combo of millet/sorghum to replace it! I have some friends with cocoa issues and was wondering if carob powder would work as well. I have read that they are almost interchangeable to use but have not tried it yet. 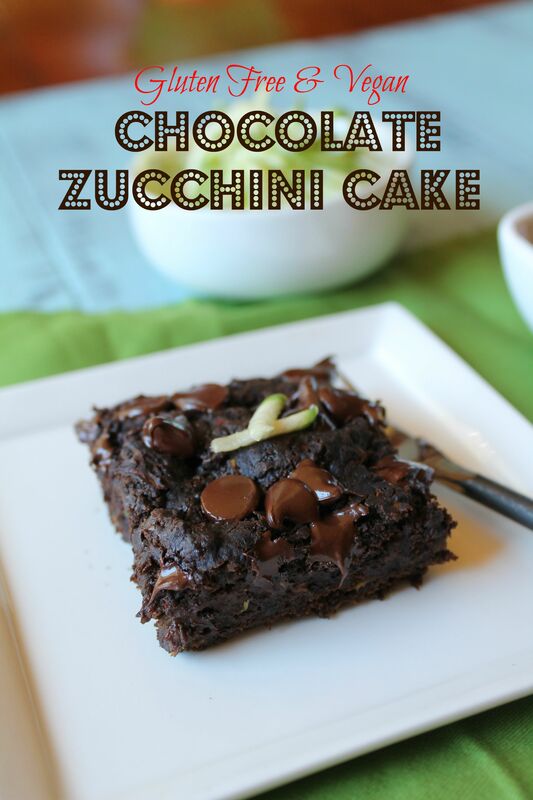 Thanks for this receipe we have a ton of zucchinis in our garden this year as well. Hi Pattie! 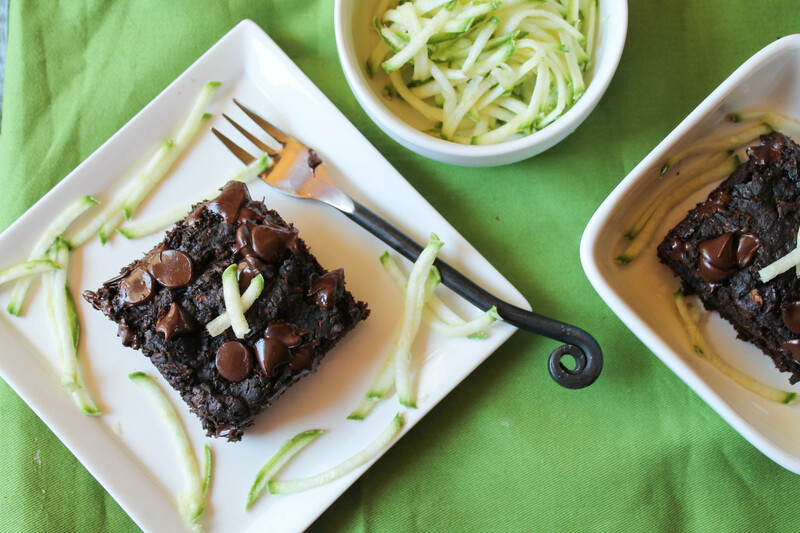 Carob will function exactly the same in this recipe. It is however, a very distinct flavor all it’s own….i thinking expecting chocolate lets some people down. Carob is delicious in it’s own right, but it doesn’t taste like chocolate, at least to me! you’re a good friend for thinking of them! Tessa, I made this cake yesterday for my son’s 19th birthday. I pureed the zucchini and you couldn’t tell it was in there. I did powder the coconut sugar and it turned out great. Even my picky 12 year old who won’t eat my healthy desserts ate it. I just told him it was chocolate cake. The whole pan went over good. It was so moist. I might try the avocado chocolate frosting with it next time. Thanks for the great recipe. Could you powder coconut palm sugar for the powdered sugar for the frosting? Looks good, can’t wait to try it. Of course Mary, the palm sugar flavor marries really well with chocolate!! How much Stevia liquid sweetener do you use. I have the Sweet Leaf brand. Not sure if that is what you used, but I would love to use 1/2 Stevia and half palm sugar. i like sweet leaf too…try 1/2 cup palm and one dropper (about 20 drops) of sweet leaf and take a taste! Thank you so much! I am very excited to make these! Yeah! I just stocked up on zucchinis from the local farmers market! Totally going to try this one! Thanks for Sharing! hi Erika! Xanthum gum is an option, leaving it out is an option (slightly more crumbly), or 1/8 teaspoon of gelatin in 2T hot water to thicken could work too! Yum! This looks great! Thanks so much for sharing! Are you kidding Krissy?! You have come to the right place with weird sensitivities! Tapioca is generally interchangeable with any starch…corn, arrowroot, and potato. Potato lends a drier crumb than the others. I also be replacing with oat flour would work too! Well, Tessa, you did it again! This was absolutely addicting! I did make a couple of tweeks based on what I had on hand… made my own oat flour, used agar in place of the guar gum, added about 1/4 cup of almond milk, and made the frosting on the stove top in a regular pan (opposed to the double boiler method). When the cake was done, and still hot, I poured the frosting over the cake (like an old-fashioned sheet cake.) Oh! And pureeing the zucchini beforehand was a stellar idea! Seriously the BEST cake I’ve had in a LONG time! I’m not GF any longer but still bake GF. I did not expect this to taste so gosh darn good! I took your advice and used my food processor to blend the zucchini all the more and I think that was the secret! THANK YOU for this amazing recipe! Here is the secret to making quinoa flour palatable: you have to toast it. Seriously! I’m afraid I can’t take credit for that discovery though. I do just toast mine on the stovetop though, wait till you smell the nuttiness & it turns a bit golden. Can’ wait to try it laura, thanks for the tip! We can’t do oats (or nuts). What would be the best sub for the oat flour? More brown rice? Or I have quinoa flour or millet. Thanks. I would do an equal mix of all three Laura…only if you like their flavors. (by mixing them, none of the flours stand out too much) I have yet to find a way to use quinoa flour in a way I enjoy, is that one you know you like? Thank YOU leslie for letting me know….you're making me crave this yummy treat! I made this today, and it tastes awesome! Thank you so much. 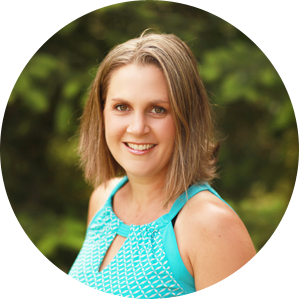 Your site is a great resource! No not odd, thanks for catching my error!! 1/2 CUP plus 2T! Odd question – but how much brown rice flour did you use? 1/2 plus 2 tablespoons brown rice flour – is that 1/2c + 2T? OR 1 or 2c? Thanks mucho!